​​Infants should not be switched to cow's milk before they are at least a year old. Experts recommend that infants either breastfeed until they are at least a year old (or older) or if not breastfeeding, they should be fed an iron-fortified formula. The main reason behind not switching to cow's milk before a year is because it doesn't contain any iron, and so replacing breast milk or an iron-fortified formula with cow's milk could put your baby at risk for developing iron deficiency anemia. Some infants also have problems digesting large amounts of cow's milk. Switching to goat's milk, soy milk, or almond milk, etc., would also not be a good idea. Stick with breast milk or formula until your baby is at least 12 months old. Unlike the standard rule to avoid switching from breast milk or formula until 12 months, there are fewer rules about baby food. This likely comes as a surprise to parents who remember being told to delay allergy foods until infants were older. What are the latest rules for introducing baby food? The latest research basically supports one rule - "Although solid foods should not be introduced before 4 to 6 months of age, there is no current convincing evidence that delaying their introduction beyond this period has a significant protective effect on the development of atopic disease," including eczema, asthma, hay fever, and food allergies. Of course, you still want to make sure that some of those foods are rich in iron, including iron-fortified cereal, iron-rich vegetables, and meats. 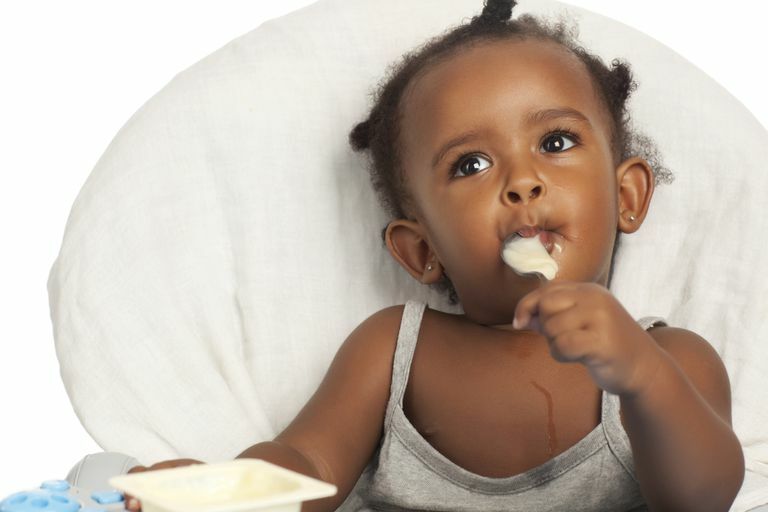 Since yogurt is more of a snack type food, you likely want to wait until your infant is eating three meals a day consisting of a combination of cereal, vegetables, fruits, and meats, etc., before introducing yogurt. And that likely won't be until she is about eight or nine months old. Are there any benefits to giving your infant yogurt? Sure. Plain yogurt is usually a good source of protein, calcium, and vitamin D.
But the big draw for many parents seems to be that yogurt contains probiotics—the live active cultures. From boosting your child's immune system to curing colic, a lot of people rave about probiotics. Unfortunately, many studies have shown that the giving extra probiotics doesn't necessarily live up to all of the hype. And there is a good chance that your infant is already getting probiotics. Breastmilk contains probiotics and so do a few infant formulas, including Gerber Good Start Soothe. Keep in mind that many yogurts for kids, if they aren't specifically marketed as being for infants, can be high in added sugar. So introduce yogurt when you think your infant is ready for a snack, especially as it can be a good idea to get your child used to eating a food rich in calcium and vitamin D. You don't have to do it because of all of the hype surrounding probiotics, though. You also don't have to go out of your way to buy organic yogurt or organic milk either. According to the American Academy of Pediatrics, "There is no evidence of clinically relevant differences in organic and conventional milk." How Much Formula Should You Be Feeding Your Baby? Can I Give My 11-Month-Old Scrambled Eggs?